It is a truth universally acknowledged that The Lizzie Bennet Diaries is, like, SO TOTES ADORBS. Am I rieeeeght?! So upon discovering that the story I fell in love with on YouTube was going to get a companion novel, I was excited. And a little scared. I mean, what if this novel was just some flimsy, ill-conceived attempt to make bank on the incredible success of the web series? 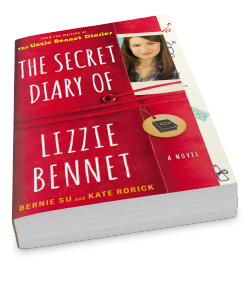 The Secret Diary of Lizzie Bennet does follow the same set of events that unfold over the course of Lizzie’s videos, BUT instead of simply rehashing everything the reader (viewer) may already know, it compliments the story wonderfully, giving the reader more insight to Lizzie’s innermost thoughts and events we as former viewers weren’t aware of. It fills in all the pieces between the videos. You get to see more of Lizzie’s interactions with Dr. Gardiner, her struggles with school, living at home, changing relationship dynamics and growing up. You see her wondering, as circumstances get more real and complicated, about the wisdom of releasing so much of her life online and how transparent she should be while still endeavoring to be as honest as possible with her viewers. It’s her coming of age story… again. But a little more personal this time, since before we were simply the viewer, and this time we get a front row seat to her private thoughts. – There’s more behind-the-scenes with Lizzie’s parents and her sisters. It’s an expanded view of the Bennets and Lizzie’s interactions with them, And this is one of my favorite parts of this novel — seeing beyond Lizzie’s typical reaction of exasperated affection for her family and watching her come to certain realizations about her family and herself in relation to them. – You also get a bit more Darcy. Can I get a fistbump? Little hints… The Most Awkward Dance Ever™. Darcy’s letter. San Francisco. Yesssssss… I know. – The audiobook is narrated by ASHLEY CLEMENTS. Though the novel in book form has some visually interesting elements, listening to this book made it almost feel as though Bernie & Co. had released a bunch of brand new episodes. LBD Season Two! Kind of. Not really. But it was awesome to hear everything in Lizzie’s voice and how she’d say it. Plus… ya know, costume theatre voices. – There were some truly hysterical moments in this book, as in I laughed myself to the point of tears. – There were also some really poignant, heart-rending moments that, again, had the end result of tears. So why the 4.5 since I loved this book so much? Well, simply this: I asked myself how the novel would stand on it’s own without the reader having been familiar with the YouTube series. And… I’m not really sure. My initial impression is that this book is better served with foreknowledge of the web series and it’s spin-off episodes. I think some events would feel truncated; lacking a bit in depth and emotional payoff. Especially when it comes to the climax and resolution of the story. Especially when it comes to Lydia’s storyline. Not that it was badly done in the book. I actually loved all the Lydia/Lizzie time we’re given in this novel. It’s fantastic, but Lydia’s downward spiral was a slow, gradual process in the videos; the viewer helplessly watching her slide further and further away over the course of months. However, reading Lydia’s story line purely from Lizzie’s POV, it doesn’t have (and understandably so) that same emotional resonance if the reader is unfamiliar with the story that’s already been established through the videos. Overall. If you loved The Lizzie Bennet Diaries, this book is for you, because The Secret Diary of Lizzie Bennet is pretty much the motherload of special features/extra content as it broadens, deepens and expands upon the story in the original web series. I really need to get my hands on this book (and the DVD!). Yes. Yes you do The series is on DVD, but the full series and it’s spin-off episodes are still available to watch on YouTube!